It’s an exciting day for us! One year ago as of today we posted the first page of Amya online. Boy, does time ever fly! We’ve decided to celebrate by eating cupcakes, and the comic has decided to have some as well. 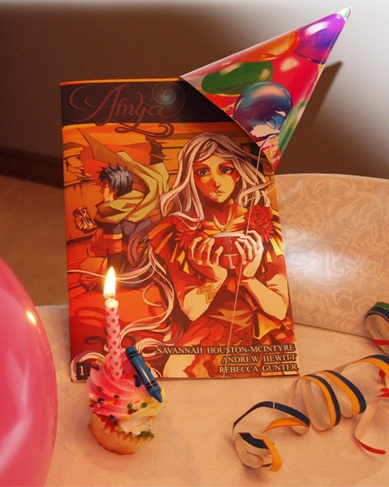 To celebrate Amya’s birthday, we are going to give a 10% discount off all purchases of chapter one made over the next month, you just need to use promotion code “1Birthday2010”. Accel is exasperated at finding a beautiful blond in his bed… I guess it really has been a long day for him. But Faye in panel 5 is the most desperate form of cute I have ever seen. It really made today’s comic for me. And a question, your posting name is Faye, but you sign everything as Savanna. Which name do you prefer us calling you by? And don’t opt out with an “I don’t really mind,” because that is a given. Which name do you prefer by even a little bit? Haha. Well, it really doesn’t matter that much. I will know who people are addressing either way. Savannah is my real name, but Faye is the nickname attached to the admin account. So really, you are free to call me by either! A blonde? She’s more of a… man, what would you even call someone with white hair? A white-head? A blancette? Ditto on both the congrats, as well as hoping we get another year of this beautiful comic! Errrr… how old is Accel anyways? I’m too young to be a cougar! How did she get from her room to his? She was going into Room 5. Color me paranoid but I’m wondering if something else snuck in… a shapeshifter, perhaps? Maybe he got confused as to what room was his, being so tired? Or maybe Faye thought ‘The hell with it!’ and decided that she would share the room with him, like she wanted to in the first place? Either way, his ‘bwah?’ body language and Faye’s wide. fearful eyes make that the cutest panel in this strip! Maybe it’s my computer… I took another look and you might be right about her popping in there… Maybe she did it while he was closing the window…? Auuugghhh! I don’t know, but I really want to see what happens next! So I was right? Cool! FAYE IS SENDING YOU SIGNALS MAN. :P Still, adorable little page. Although I somehow doubt anything else will happen tonight. One random encounter a day. And yeah I totally get the “I’m scared and don’t want to be alone” vibe as opposed to “I don’t want to sleep alone *wink *wink” vibe. I just love Faye’s expression in the bed, reminds me of when I was little and scared of the dark. <3 So cute. That’s the way to do it Faye, lol. She’s adorable! Happy birthday, Amya! Faye, you make me B’AWWW~. Don’t ever stop, you lovable muffin, you. and happy birthday to the comic! Very exciting! Faye hiding behind the covers like a little girl is so cute, it made me lol. now then. HAAAAAPPY BIRTHDAY HAAAAPPY BIRTHDAY HAPPY BITHDAY HAPPY BIRTHDAY, HAPPY BIRTHDAAAAAAAAAAYYYYYY! to Amya. Um… wow, I’ve been following this comic since the very beginning… it really stunned me to realize I have been following it for a full year. When I saw the posting about the birthday I was like “wait… what? It hasn’t really been a year has it?” Wow, I guess folks are right when they say time flies and all that. I love this comic, can’t wait to find out more of what’s going on. Keep up the great work! You know, I just realized something… didn’t that thing slice Accel along both the back and arm? What happened to his wounds? Magic perhaps? No, he’d have fixed Faye himself by now. Faye seems to be fixed up too. She had a rather nasty wound on her right arm earlier from the train. Don’t know who did it, but somebody obviously used healing magic on both of them. One year, already? Happy birthday! No, Faye’s wound is still there. Also Savannah commented on her Facebook page that the last three pages where done and uploaded before she noticed that the wounds were missing. They will be fixed and reposted when she has time. Aaand back to the zombie rats. Fred: Dang it there goes our meal for the night. Bob: You just HAD to try the cute trick one more time! Sure it works to keep them in the room but between the murderer and the drafts they never stay there long enough. Fred: Well if someone could find the jugular Faster we wouldn’t BE in this predicament. Bob: Hey those sheets are hard to walk through! Unfortunately, I’m getting feelings of terror vibes from Faye, not seductive vibes. My shipping will have to wait. Awesome comic by the way. I just found it and it’s awesome. 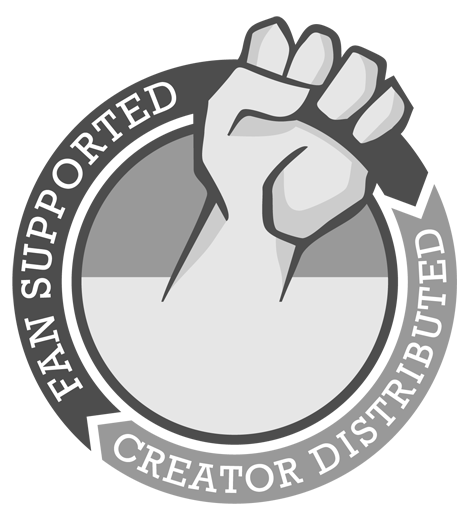 I’m happy to hear you are enjoying the comic! Thank you so much for posting. He could grab the bedding from the other room and lay it out on the floor. Those eyes cannot be denied.